It’s once again time for the annual Cocktail Showdown in which our three judges experience and then highlight the best libation creations offered by a variety of local participants. Ranging from local tavern to fine cocktail bars, the showdown will bring our judges all across the metro area to sit down with some of the most creative cocktail minds in town and be served up two entries from each location. Each week we will visit and rate two creations from two establishments and then share only some impressions with you, our readers. Both the shot and the drink will be scored and ranked with the final results to come after we have sampled all of the entries. Week one brought us to Sazerac Alley with Jason Laub and Dan Olson before we hiked on down to The Sidestreet Grille and Pub to visit Andrew Hardy. These are the creations we were served on an unusually warm evening that also featured game seven of the World Series. Located at 220 North Broadway and occupying the former space of Monte’s since March of this year, Sazerac Alley brings a melting pot of culinary and beverage cultures as a tribute to New Orleans. 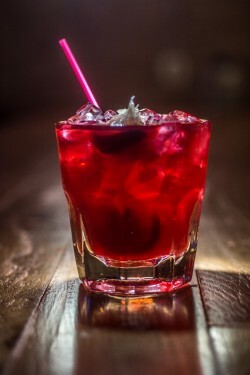 With one of the largest selections of whiskey and craft spirits and an ideal atmosphere for enjoying a classic or modernly interpreted cocktail, Sazerac Alley fits into the downtown casual upscale scene. On the night we were there to judge, we all took great delight in an impressive set of acoustic music by Kwaician Traylor, whose solid guitar grooves served as a great foundation for his soaring, beautiful voice. Future live music events at Sazerac include performances by Nora Hyde, Twelve Strings, and Big Fun - A Peanuts Christmas Concert. 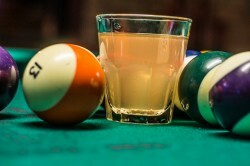 Dan named this one with the New Orleans theme of the establishment in mind and its base is a traditional New Orleans spirit, Herbsaint absinthe, which is known for its strong herbal properties without being as bitter as some of the other absinthes. Dan added blood orange puree, lemon zest and grenadine to a shaker with ice before shaking and straining into shot glasses which were garnished with a single lemon wedge each. 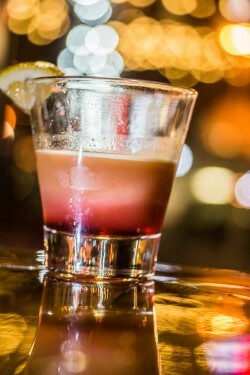 Delivering lingering licorice and herbal flavors with a pleasing lemon burst at the front and a sweet grenadine finish this shot is like a night in New Orleans, full of a variety of flavors and pleasant surprises. Named for the ingredients and the technique known as a “flip”, where an entire egg is cracked into a shaker, which I’ve heard about but never tried, this cocktail was also my first time experiencing a “fat washed” bourbon. Jason “seasoned” a bottle of Buffalo Trace with bacon fat at room temperature for 2 hours and then in a freezer for 4 hours to impart hints of bacon flavor to the bourbon, which goes into a shaker. He then cracks the egg into the shaker and adds Fratello hazelnut liqueur and maple syrup before dry shaking to blend the drink while fluffing the egg. 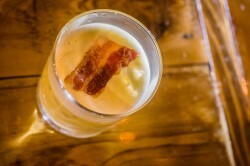 Strained into a rocks glass and garnished with a candied bacon strip, this drink comes across as breakfast in a glass. Celebrating one year at its new location on the corner of 4th street and 4th avenue North, the new Sidestreet offers a clean, comfortable tavern-like environment with a full menu of grill options to choose from, as well as pool tables and plenty of TVs dispersed throughout. They also feature a diverse lineup of 50 tap beers. When they remodeled this new location, delivering a live music experience without a cover charge was a goal and the room always sounds great. They also expanded their charitable gaming area and their Tuesday Night Open Mic and Jam Night, hosted by Pat Lenertz Band, features some of the best talent in the area. Fridays and Saturdays are usually packed, with live music from 10pm till close. Kapeesh is the next scheduled act, on Saturday, November 12. Created when Dempsey’s staff came in and requested something pear-flavored, Andrew adds Chase elderflower liqueur, angostura bitters, lemonade, sour mix, and 7-up to a shaker with Absolut Pear in it before shaking with ice and straining into a shot glass and presenting with no garnish. Flavors of pear and citrus blend in a way that results in a flash of flavor that comes across almost like a floral white wine, before finishing slightly sour. Named for giving hints of the classic whiskey cocktail, this tequila-based drink changes perspectives on tequila and its uses. Andrew made his own hibiscus infusion of Casamigos reposado and also adds a homemade clove simple syrup and a splash of Aperol to muddled lime and bitters. Shaken and strained into a rocks glass full of ice, it is presented with a slice of lime as a garnish. It drinks like a fruit punch packed full of peppery reposado tequila and hints of herbs and hibiscus, with a finish that is fairly dry and tart. Hibiscus really does a lot to infuse the tequila with a strong floral essence that pairs well with the peppery aspects of reposado.